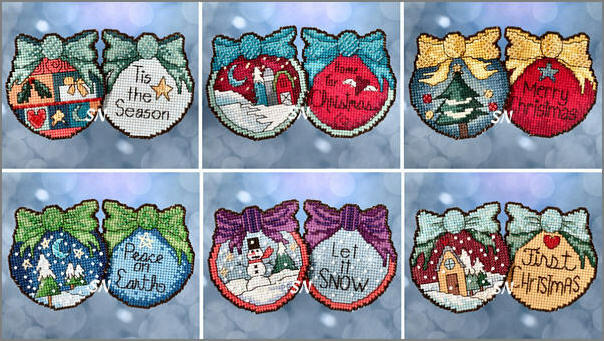 Welcome to Our Designer's Showcase of Bead Kits for Mill Hill! Mill Hill has commissioned several artists to present their artwork in Bead Kit format! 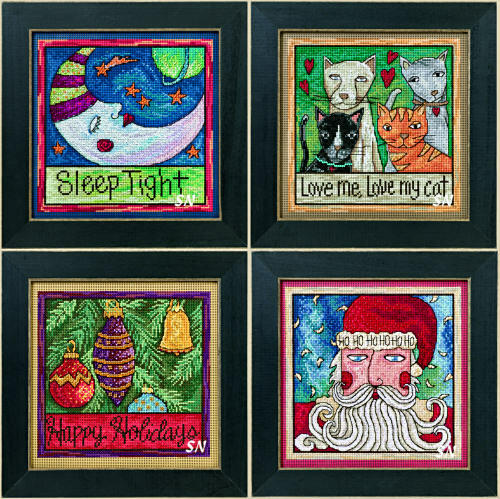 Enjoy the artwork of Quilt Artist Jim Shore, Folk Art Artist Debbie Mumm and Sarah Grant (STICKS) -- Old World Santas, Snowmen, Playing Cards, Reindeer, and charming bites from life -- these artists bring delightful designs to this stitching venue. Each of Mill Hill's kits contain the chart, 14ct perforated paper, various counts of Aida cloth or 28ct linen for your Cross Stitching. Mill Hill beads garnish everything, so along with each artists color-schemes and personality... each finished design will glisten with Mill Hill glass beads! Here we go! Wow... don't you love these bright colored fluttery butter and dragon flies? By Artist Laurel Burch - Mill Hill has charted her designs, given us white perforated paper, along with DMC floss and a smattering of Mill Hill glass seed beads to stitch these glorious studies in color! Finishing approx 6 x 6, each is presented in full kit format. Frames shown are available separately. If fabric is your preference, choose a white in 14 or 28ct - so the beads will fit into the design. 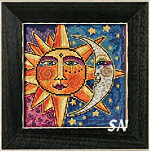 Laurel Burch's Sun and Moons in Cross Stitch! WOW, talk about color and bold design! 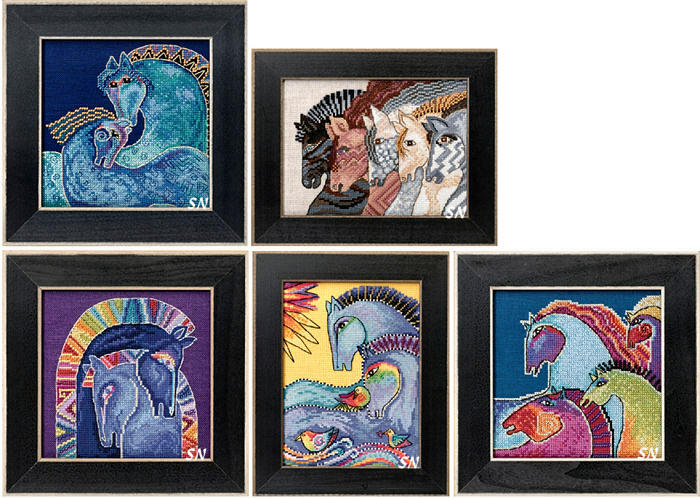 Laurel Burch's artwork is once again presented to us in Cross Stitch by Mill Hill! Presented as a set of 6 kits, each is stitched on 14ct brown perforated paper (which you can change out to 14 aida or 28ct linen -- colors of your choice.) Bright DMC floss colors throughout, with those glistening glass seed beads by Mill Hill, these can't help but be stunning eye-catchers. Aren't these magnificent! Stitch them on 28ct Linen or 14ct Aida... you choose! 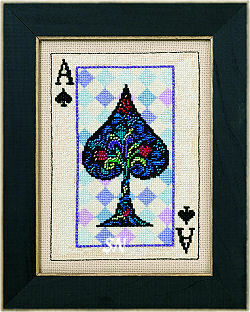 Kits include Beads, 28ct linen or 14ct Aida, floss, needles, chart and instructions. 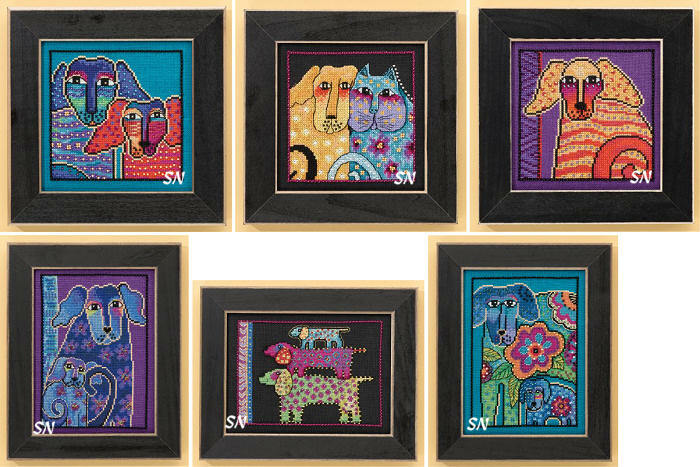 Mill Hill presents the ever-charming and famous artwork of Laurel Burch's dogs in Cross Stitch! Joining their collection of CAT kits, we now have 6 new dogs to stitch as well! The colors in all of these are rich -- everything is accented with either gold metallic thread, or gold glass beads. Offered in complete kit format, Mill Hill has made them with Aida or Linen as the base fabric -- you decide -- and added all the necessary DMC flosses and metallics as well as a smattering of seed beads to make them glisten. Two are stitched on a Tropical Turquoise, two are on a charcoal gray, and two are on a rich purple background. So darn cute and colorful... I don't know how you can choose a favorite! 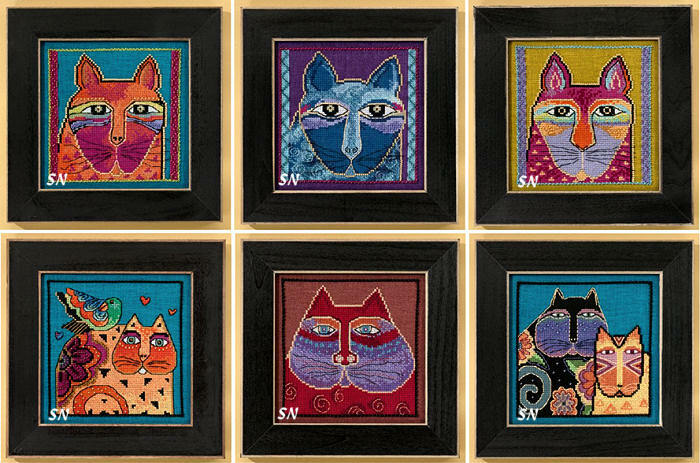 Laurel Burch Cats for Mill Hill! 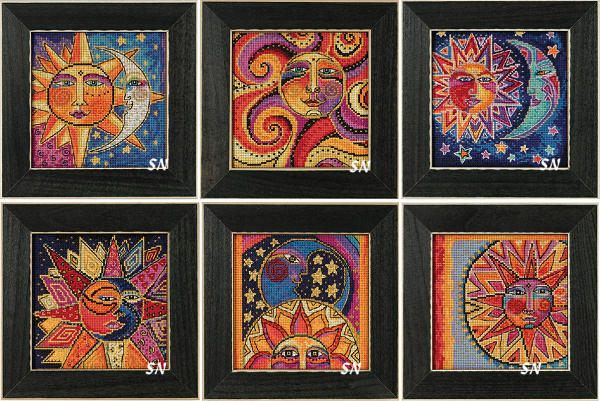 Presenting the most colorful and famous designs of Laurel Burch Mill Hill style!!!!! We are getting bead kits that are stitched on YOUR CHOICE of 28ct linen or 14ct Aida... featuring this darling artwork we've all loved for years! Complete kits contain the charts, fabric and all the colorful glass beads you need! Watch the drop-downs here, to make sure you get your fabric option correctly! Available as separate kits, or get the whole set! Oh... these are bright and pretty!!! 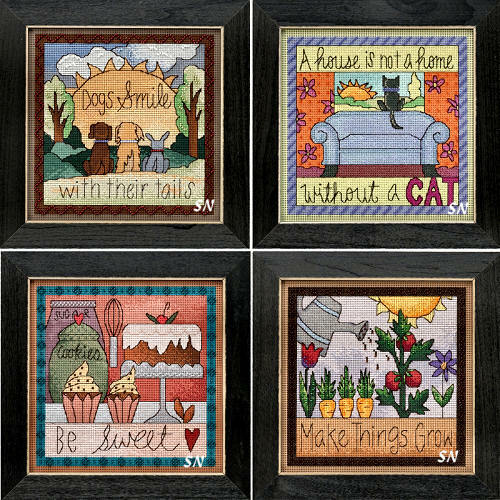 Mill Hill has commissioned 4 new designs by Debbie Mumm that have been converted to Cross Stitch with a smattering of seed beads. Presented in their kit formats, each is stitched on 28ct linen, and finish approx 7 inches square. Bright, fresh colors... each kit comes with that fun fabric, all the threads and beads and needles. I like them all...not sure which is my favorite... frame them as shown on the kit covers, or maybe make block stand-ups??? We have a new set of 4 spring-y birds by Artist -- Debbie Mumm. Charted by Mill Hill and garnished with just a few glass beads, these are presented as complete kits. Finishing approx 5 x 5, they are worked on 16ct chocolate brown Aida with DMC floss and those glistening bead accents. Gorgeous, fresh, young and current colors, they are very different from anything else we have... and totally different from any of the other Mill Hill beaded things. Don't know which one will be your favorite... might want a pair! Kits include the chart, paper, flosses, beads an needle. The brown frames are available separately. Mill Hill has a fun new series of 6 -- 16ct Aida designs garnished with Mill Hill beads. Designed by Debbie Mumm, this is a collection of darling penguins and polar beads playing around. One has the penguin sliding off the bear's back... someone is innertubing, someone else is skating... and two are hiding in packages! At first we thought these were Christmas... but they really aren't... just all a cute Winter-y theme, we like the fresh blues, reds and greens in them. Presented as complete kit, you get the chart, fabric, flosses and glisteny Mill Hill glass beads. Finishing approx 5 x 5 each VERY cute, crisp, fresh winter-y designs!!! Mill Hill has commissioned Debbie Mumm and her cheerful artwork to present this fun collection of bead kits! Good Coffee and Friends... what could be better??? 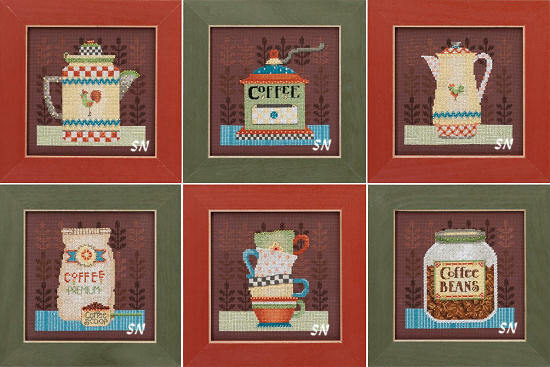 Presented in complete kit format, each design is stitched on coffee-brown 16ct Aida --- which is surprisingly easy to see. Browns, yellows, teals and greens are the predominate colors in all of them. Can you see the tone-on-tone coffee plants stitched into the backgrounds? 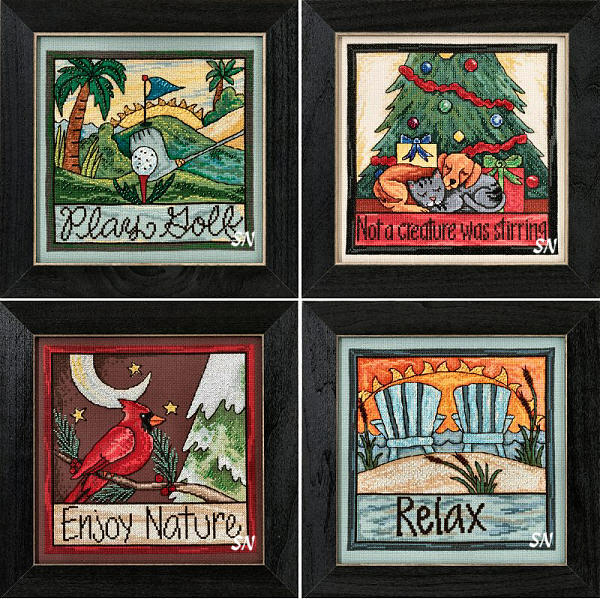 Each design finishes approx 5 x 5, and fits into one of Mill Hill's 6-inch wooden frames -- this time, either mossy green or terra cotta. Very cute! Well... Mill Hill pegged the weather correctly when they packed our box of these TOO CUTE new little guys!!! Who knew the entire country would be dealing with snow and snow, and snow....? Debbie Mumm has designed a set of 5 Bells -- Snowbelles - to be exact. Darling little snowmen with bell-bottoms!!! All offered as complete kits, they are worked on 14ct white perforated paper with DMC floss and smatterings of Mill Hill glass beads. Each finishes approx 4 x 5-1/4... much smaller than the actual things in your front yard!!! So... we introduce: Jingle, Jangle, Freezy, Flurry and Frank! Mill Hill has a festive new set of 4 Dancing Reindeer designed Each little guy is swirling around the ice -- reminds me of The Olympics! Offered as complete kits of chart, 18ct aida, DMC flosses and Mill Hill beads, all four of these are crisp, fresh, bright in color, and really fun! Finishing approx 6 x 6, they'd finish beautifully into cubed stand-ups, or framed on the wall. Very Festive! Here is a second set of small 3-inch stitched and beaded (Easter?) Eggs to join the set released last January! Designed by Jim Shore for the Mill Hill people to convert to cross stitches and beads on perforated paper, each of these small kits contains both a front and back design for each egg. So... you can have animals or geometrics... your choice! Kits contain enough ingredients for both designs. 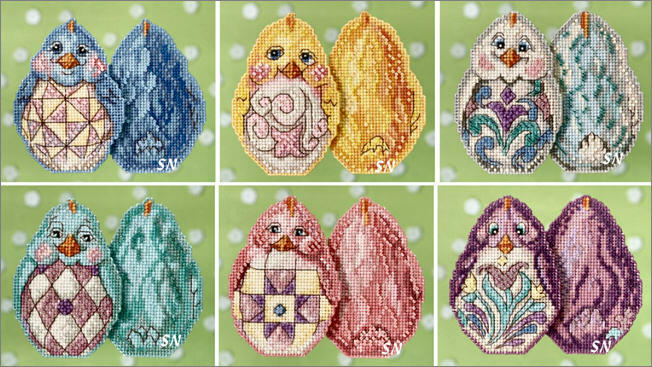 Here's a set of 6 different colored Spring Chick ornaments designed by Quilt Artist Jim Shore and adapted to Cross Stitch by Mill Hill. Presented in small kit format, these are stitched on 14ct perforated paper with DMC floss and garnished with Mill Hill glass beads. Each finishes approx 2-1/2 x 3-1/2, and what you are seeing in the picture is the front of each chick and an optional stitched back side. 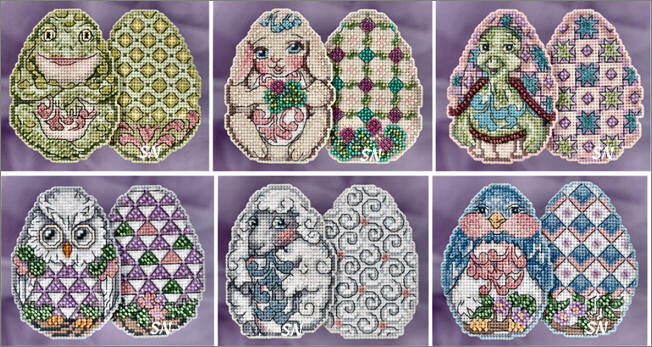 Little stitched eggs for your Spring Easter Basket! Complete kits contain the chart for both sides, paper, flosses, beads and needle. 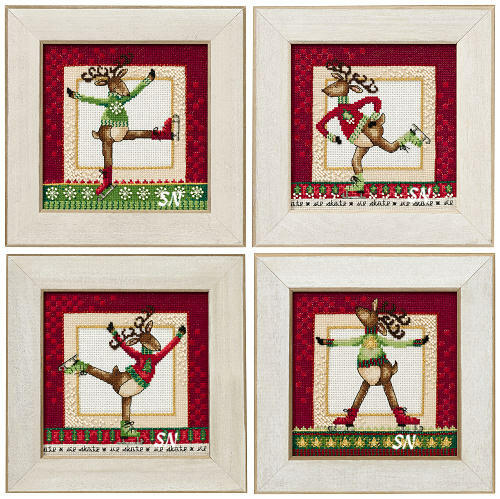 Four Christmas kits bursting with personality and color have arrived!!! By artist Jim Shore, each is stitched on 18ct Navy Blue Aida with DMC floss and Mill Hill glass beads embellishments. Just gorgeous in color, each has a different border, and a different picture in the round center section. So swirly and old-worldy! Choose between Santa, Rudolph, Mr Snowman or the tree -- or get 'em all! Offered as kits of the chart, fabric, threads and beads. Some colorful Santa Ornaments have come our way!!! 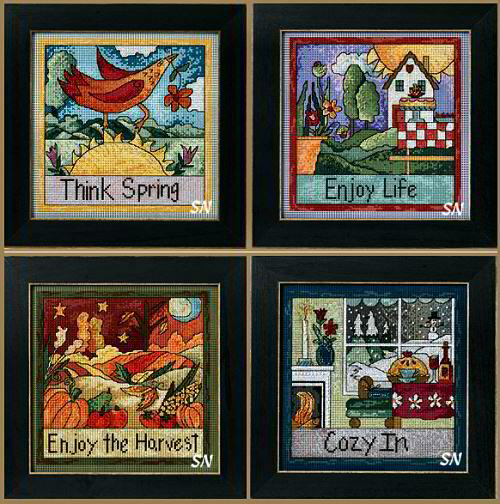 New by Mill Hill -- these feature the artwork of Jim Shore -- in Cross Stitch with Beaded highlights. 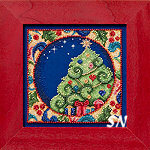 Offered in small kit format -- each Santa is worked on 14ct perforated paper with DMC floss and MH beads. They measure approx 3 x 5 when finished, and will really glisten on your Christmas Tree! 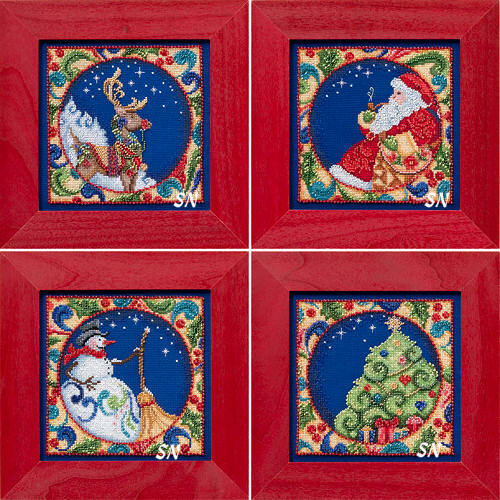 Bright colors and lots of Jim Shore's trademark Quilt motifs in the designs, there are six different Santas waiting to be stitched!!! Getting ready for Christmas -- Mill Hill has released a set of 6 paper ornaments to dress your tree. Artwork by Jim Shore, we already have six Santas -- now here are three more for that set. The snowmen are completely new. Offered as perforated paper kits, each is full of flosses, some glisteny glass beads for a bit of jazz, and lots of quilted charm. They all finish approx 3 x 5, and because they are lightweight, they display beautifully on any Christmas tree! Mill Hill has released three Button & Bead Kits that feature the charming artwork of the Quilting Industry's favored designer, Jim Shore! Full of color and incredible detail... Shore designs resin figures that all feature detailed quilt blocks and patterns decorating them everywhere. 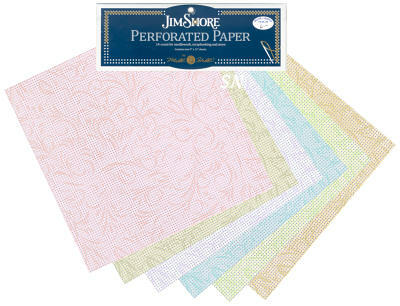 A lovely collection of 6 new pastel colors of 14ct perforated paper has arrived! Very soft colors, each has the faintest swirly/floral designs printed all over them... in an ever-so-slightly darker shade. I don't think our pics can show the pretty detail very well... one can only hope! Offered in 9 x 12 sheets -- two to a package. Mill Hill and Jim Shore have brought us a really cool set of 4 playing cards -- stitched on 16ct Aida, and garnished with glass beads! Offered as complete kits, each card finishes approx 5 x 7 and is FULL of clear, bright playing card color. Stitch the King of Diamonds for (Dad? 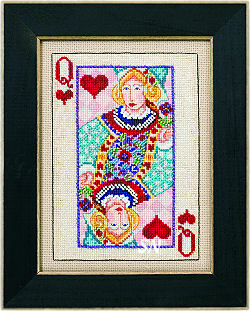 ), the poker player of the house, the Queen of Hearts for (Mom? ), the bridge player... the Jack of Clubs for (the card shark away at college?) and the Ace of Spades for (Grandma who still plays cards three times a week!!!) You can probably switch out the face cards and suits... if you want a Queen of Spades, for instance... you'll just have to get handy with a piece of graph paper. Very well done, and quite unique!!! Black Frames available by special order. Mill Hill has released a set of 4 Olde Worlde Santas designed by artist Jim Shore. All have a 'quilt flavor' to them, all share a matching background, color scheme, and general shape, but each features a different Santa. Crisp bright reds and yellows, all are worked on an icy blue colored 14ct perforated paper in DMC flosses and glistening glass beads. Of course, you can always stitch them on linen instead... either way, they finish a generous 5 x 5. Very vibrant, each is offered as the complete kit of chart, paper, flosses, beads, needle and button embellishment. We have a set of coordinating snowmen, too! Ok... these are here... but the set of 4 of them has NO NAME!! They are a set of 4 cross-stitch and beaded snowmen -- on 14ct perforated paper -- the one at the top left is Northern, next is Southern, next are are Eastern and Western! (And I don't 'get it!'... they're all frozen... and I can't tell WHAT area of the country ANY of them come from!!!) They ARE darling... I love the circular borders... and the colors are cheerful! Offered as complete kits of the paper, flosses, beads and Jim Shore button... our shop models will be on linen... and we might even make up a set that finishes ROUND -- without the corner motifs! Cute snowmen... life seems so odd... my daffodils are blooming in my backyard, but the East Coast had that snowstorm the day we received our promo-sheets about these! In Australia it's 100 degrees... so I guess it just goes to show that you can get these *anytime of the year*... because eventually YOUR winter will come!!!!! Four new 7 x 7 designs, these are presented on 14ct perforated paper and use only a minimal amount of bead embellishment. So full of personality and bright colors, Dogs Smile and Without a Cat make ME smile, and I don't even have a tail! Be Sweet and Make Things Grow will brighten any place they hang. Wood frames are offered separately. Finish them individually or back-to-back. Super cute and colorful - and NOT TOO BIG -� the lights on your Christmas Tree will make those scattered beads just glisten! 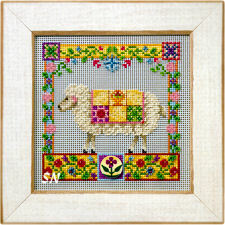 Offered as complete kits of the 14ct paper, floss, beads, charts and needle. Mini Sticks Stockings for Christmas! Mill Hill has 12 new small ornament designs created by artist -- Sticks. Presented as their small kits, each contains TWO mini-stocking designs that can be stitched and attached back-to-back -- so when they twirl on your Christmas tree, you can still see pretty stitching. Stitched on 14ct perforated paper, each contains the flosses and a few beads for glitz. 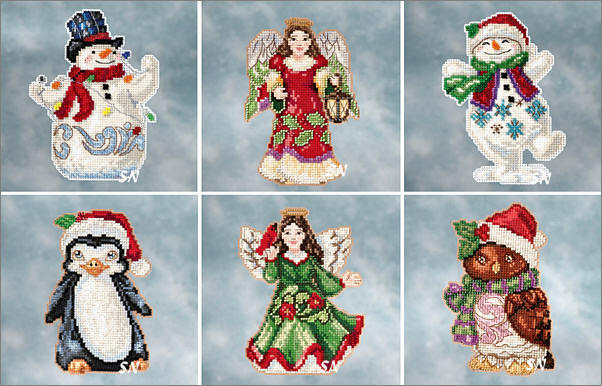 Whimsical designs... you can see snowmen, trees, hearts and holly, SUPER Colorful and festive... each kit is $8.00 -- but you get everything for TWO designs! New From STICKS -- Summer and Christmas! Four colorful and bold designs worked on 16ct Aida with a ton of DMC floss and a smattering of Mill Hill Beads, these bring our STICKS collection of designs to 20. I just love them and can let the designs themselves enchant you -- without any of my descriptions! Each finishes approx 7 x 7, and since these are on fabric instead of paper, you can make funky, wild pillows out of them. I know you can't tell from the pics, but the sun rays in both Relax and Play golf are studded with miniature glass seed beads. Presented as complete kits of the chart, fabric, flosses and beads, the frames are offered separately. 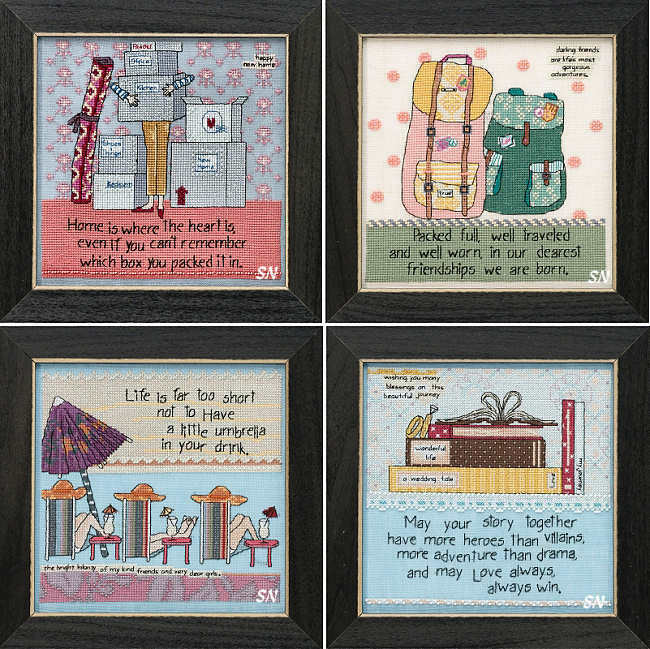 Mill Hill Presents STICKS Kits in Cross Stitch! 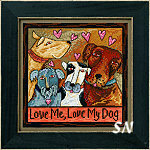 We already have a dozen designs by artist Sarah Grant... love them ALL... and here come 4 more!!!! 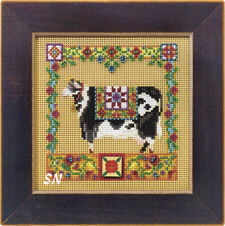 A Des Moines IA artist... Sarah has commissioned Mill Hill to represent her in Cross Stitch. 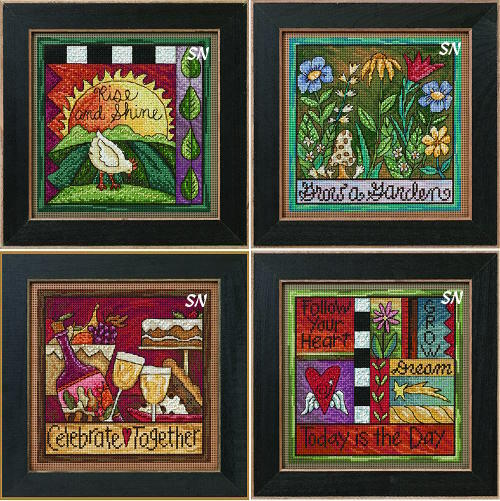 STUNNING 6 x 6 designs full of shaded color, relaxed lines and motivating sentiments, each of STICKS pieces brings a smile to your face! Rise and Shine -- little chicken set against an early morning sunrise. Perfect for a breakfast nook! Grow a Garden features a wildflower garden full of character! I LOVE that little spotted mushroom! Celebrate Together would be neat hanging in a Dining Room... or the eating area of the kitchen. (even a bakery or grocery store!) It could hang anywhere *celebrating together* is a good thing! Finally, Today is the Day is a pretty medley of reminders to GROW in your life! All of these are bursting with strong color and design elements. Bold patterns and motifs, a fresh, colorful look... do these for the *youth* in your life!!!! Offered as complete kits of 14ct perforated paper, DMC flosses, chart, needles and beads, all you add is some stitching talent! New *Sticks* Kits are here! A new set of funky-artsy designs is here! Offered by Mill Hill in kit format, we now have 12 designs from *Sticks*, and they are as colorful and brilliant as the first 8! Kind of following a 4-Seasons theme... Cozy In is the Winter piece -- with the roaring fire and falling snow -- it *does* look cozy! Enjoy the Harvest is the autumn scene -- I just love all the color in that one! Enjoy Life would be the summer scene -- the bright sun, the oversized blooming flowers -- and desert on the picnic table! Think Spring could double as Good Morning, too! All are offered in kit format with 14ct perforated paper, chart and needles, all the flosses and tons of Mill Hill beads to make them glisten! Each finishes approx 7 x 7, and definitely rate a *#10* in the Visual Impact and WOW category! Mill Hill Presents 4 New Designs by Sticks! This artwork is so fresh, classy, colorful and crisp! Mill Hill has 4 new perforated paper kits (OK... if you're a *fabric-stitcher* -- do these on fabric!) for Christmas and everyday. Sleep Tight would make a great birth announcement... but could hang 'as is' in the Guest Room... or above anyone's cozy bed. Love Me - Love My Cat is the companion to Stick's Dog piece! Holiday Ornaments and Ho Ho Santa are stuffed with color... I really can't choose my favorite!!! Each is presented as a complete kit of chart, 14ct perforated paper, tons of flosses and Mill Hill seed bead embellishments, and finishes approx 7-1/4 inches square. Something fresh, young, and contemporary... they make everything around them feel good! Mill Hill has taken the artwork of 'Sticks,' a Des Moines, IA, artist who specializes in making one-of-a-kind art and furniture items from fallen timber from their nearby areas. I am in LOVE!!! A new line of bead kits, worked on perforated paper (yes, we'll be stitching ours on 28ct linen! ), these are Over-The-Top Charming, Colorful, Funky, Fresh, New, Young, Cool... GOTCHA! 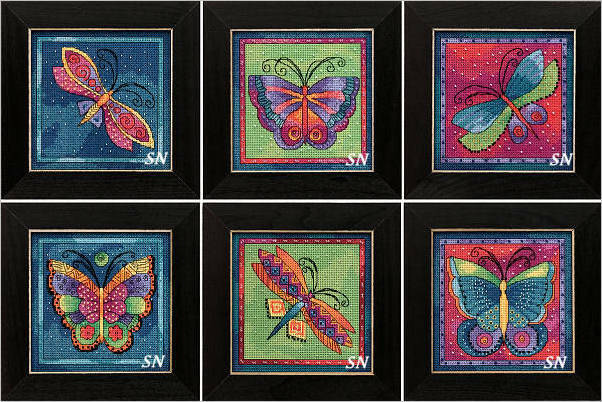 Finishing 7-1/4 x 7-1/4 each, they are offered as complete kits of the chart, hand-painted perforated paper, needles, beads and flosses. If you want the frames, they WILL fit stitching done on 28ct. Just make sure to order the same number of frames as your kits! Just *look at* those cool dogs, and don't you just ooosh over that Cherish Family? The colors... everything just pops! We expect shipment this first week of January! We think these *girly* motivational designs are just the best! You see the artwork on napkins, banners, mugs, greeting cards... all kinds of fun places. The folks at Mill Hill have the design rights to bring them to us in Cross Stitch! And because Mill Hill is 'Bead Central'... they are slightly adorned with a few Mill Hill glass seed beads. Each is offered as a complete kit of chart, 28ct linen, DMC flosses and a nice smattering of beads. They finish about 7 x 7... and fit into Mill Hill 8-inch wooden frames (which we can order for you.) NEW HOME, FRIENDSHIPS, LOVING LIFE & WEDDINGS are the themes with this newest set of designs. Home is where the heart is, even if you can't remember which box you packed it in. Packed full, well traveled, and well worn, in our dearest friendships we are born. Life is far too short not to have a little umbrella in your drink! May your story together have more heroes than villains, more adventure than drama and may love always win. Everybody loves Curly Girl's whimsical artwork and her *wisdoms of life* advice! 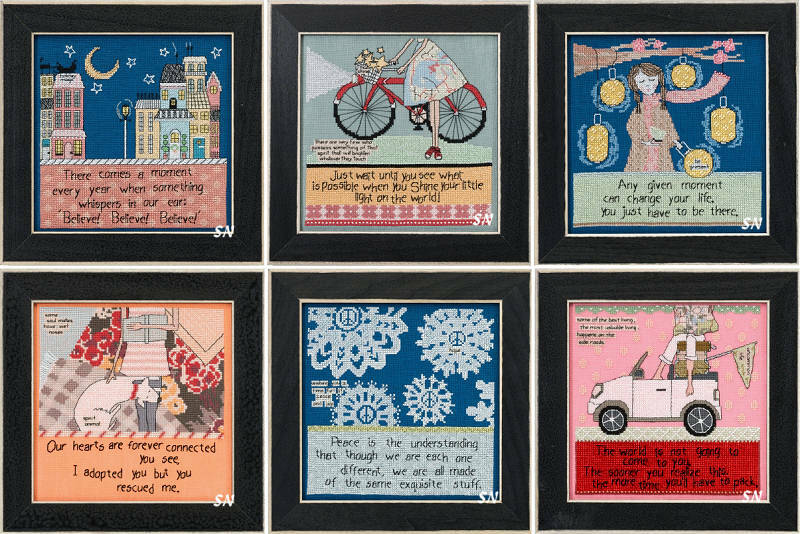 Mill Hill has a license to produce her designs in Cross Stitch, so six new designs have come our way. Presented in kits of 28ct linen, Mill Hill glass beads (not tons, just enough for a little glitz) and DMC flosses, these are over-the-top cute! Each finishes approx 7 x 7. Oh we LOVE these designs - Mill Hill has converted this darling artwork into Cross Stitch on linen with some bead highlights! Finishing approx 6 x 6, they are cheerful, motivational, insightful bits of life's wisdom presented in a light and whimsical way. Offered as complete kits of chart, linen, flosses, beads and needles... we have something like 24 in this collecton - but I think these are some of the best so far! Stick of Butter - Talks about times in life that just are better with a stick of butter added! On My Left - A friendship thing... talks about the friend on the left... and there is even a little dog there on the left! Taste in Friends - You can be thankful for good wine and you r exquisite taste in friends! Journeys - Since every journey starts with a single step, you should probably have on a cute pair of shoes! Here is the next set of 4 designs by Curly Girl -- these four bring our collection to 20! 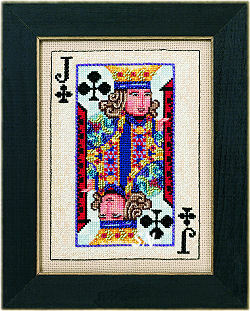 Presented in full kit format, you get the chart, linen, flosses and beads to finish these 7-1/2 x 7-1/2 inch designs. I think my favorite this time is the Old Friends one... Old Friends cannot be made... they must be grown! Cute, colorful and whimsical, make sure you see the rest of Leigh's collection! 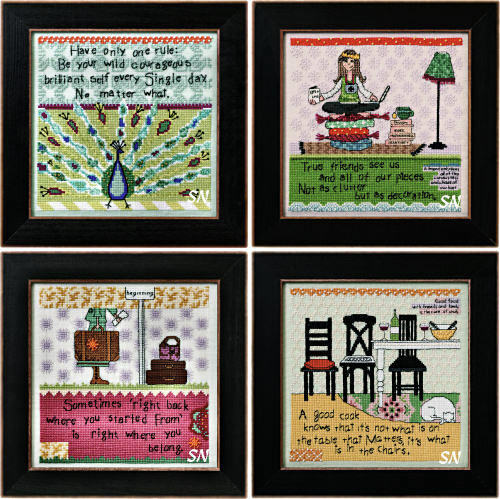 Mill Hill has 4 new kits by Leigh -- of Curly Girl Designs. 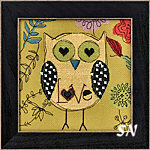 You see her artwork on lots of things -- stationery, napkins, tea towels and coffee cups -- and we get to stitch it! I love the contemporary verses and the fresh color schemes. Can you see the patterns in the backgrounds? Some of that is done with beads, the rest is stitching -- and it adds a touch of charm! Offered in complete kit format, each 7 x 7-ish design is worked on 28 ct linen in DMC flosses and is smattered with Mill Hill beads all through out the design. New Curly Girl Design Kits!!!! 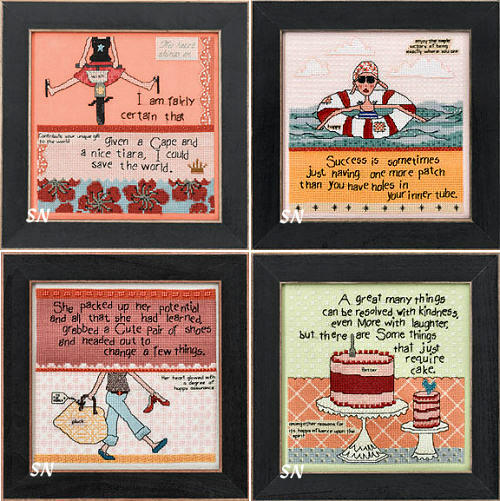 I just LOVE these designs... totally motivational, totally cheerful and upbeat... totally on the mark for a good life! Here we go!!! Each of these is offered as a kit stitched on 28ct linen, (creams, an orange and bright green!) DMC flosses and a few Mill Hill bead garnishes. They finish approx 7 x 7 -- quite generous actually -- so you can see all the pretty tone-on-tone stitched patterns in the backgrounds. These four join our other Curly Girl Designs... al AWESOME! 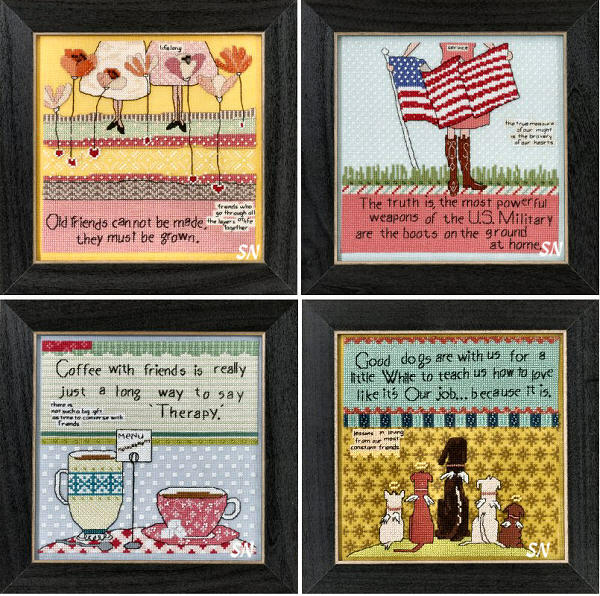 Mill Hill has teamed with Kansas Artist Curly Girl Design to present some of her original artwork in Cross Stitch -- designs that artist, Leigh, promises could change the world!!! The Peacock design advises one to be your brilliant self everyday -- no matter what. *Clutter* says that 'True friends see us and all of our pieces... not as clutter but as decoration!' *Right Back* deals with where one started from turning up right where you belong... and finally, a good cook knows that it's not what is on the table that matters... it's what's in the chairs!!! A set of four designs, these are offered in complete kit format with 28ct linens, tons of DMC flosses and Mill Hill beads, chart and needles. Each finishes approx 7 x 7. The style is whimsical and very fresh. Soft in colors, really fun, and very meaningful. What a delightful collection of simple black-line doodles from Amy Lee Weeks! The people at Mill Hill have converted them to Cross Stitch on 18ct white Aida, and embellished with a few glass beads here and there. Design sizes finishing approx 5 x 7, each is stitched with 99% DMC black floss and accented with simple striking colors in the design borders. 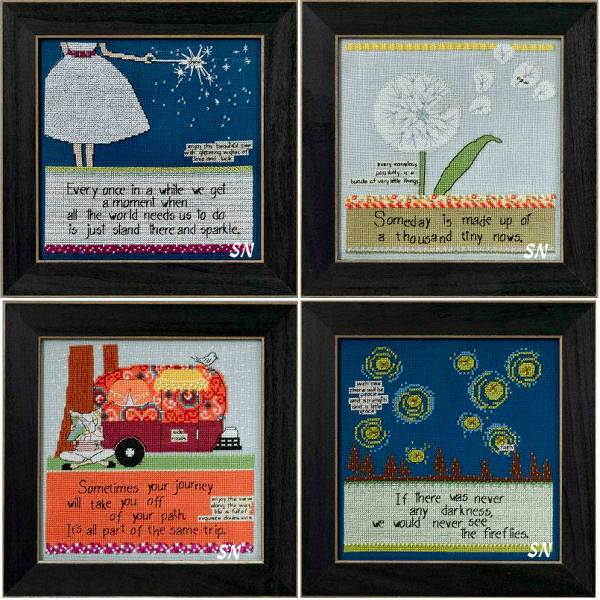 We have four new designs by artist Amy Lee Weeks that have been adapted to cross stitch by Mill Hill. So simple, yet so full of bold color and quiet advice, each is stitched on 14ct Aida with DMC and almost NO beads!!!!! Framed in black 8 x 8's, these are so clean, fresh, young and new... stitch them for someone young-at-heart in your life! Oh my Gosh... AREN'T THESE CUTE??!! 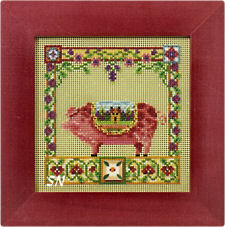 Mill Hill has licensed a new designer for their line -- Amylee Weeks -- and adapted her original artwork into Cross Stitch! 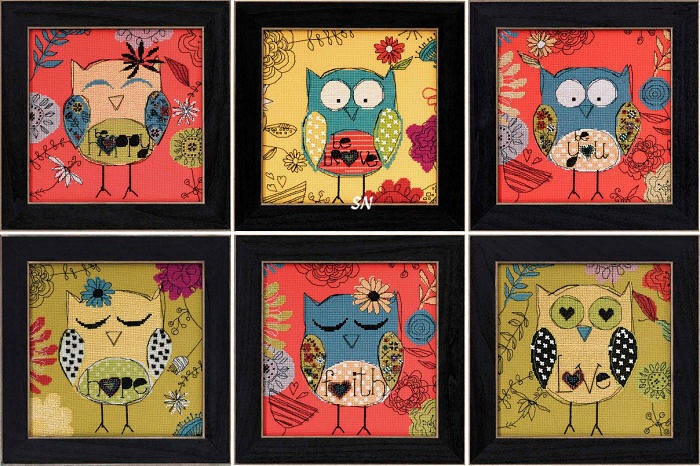 Offering a set of 6 colorful owls -- each delivering a fun and uplifting sentiment -- these are offered as complete kits. Finishing approx 7-3/4 inches square, each is stitched on 14ct Aida in the most lip-puckering colors of Riviera Coral, Gold and Olive. You just can't help but love the colors and the whimsical flavors of these!! There are 8-inch frames available for them as well... and notice that three say *Faith * Hope * Love*, while the other three say *Be Brave * Be You * Be Happy. * Everything is simple Cross Stitch with a few small bits of bead embellishments (not a lot) and then backstitch. The long backstitches on them give you that relaxed whimsical feel.